The Monster High ghouls know how to embrace their freaky flaws. And when they have to rally to save the school’s dance, they decide to focus on those freaky flaws as a fabulous theme. The ultimate skel-ebration of monster mania, the Freak du Chic dance will be the monster bash to end all bashes. The ghouls will be dressed in over-the-top circus-inspired fashions. 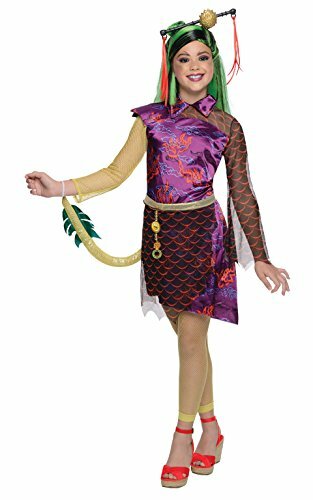 Jinafire Long, daughter of the Chinese Dragon, takes advantage of her scaritage as a fire breather -- her flame-inspired fan actually fits in her hand and the “blowing flame” fits into her mouth to really set imagination on fire! Plus, her dress is hot with a dragon-inspired print, sheer scale-inspired hem and scary cool collar treatment. Tall red boots (with fiery effect), a green belt and flaming headband burn with style. Kids will love recreating favorite scenes or creating a new show of their own. Jinafire Long doll also comes with a doll stand and a mini Freak du Chic poster. Collect her fellow Freak du Chic ghouls (each sold separately) for a full circus! 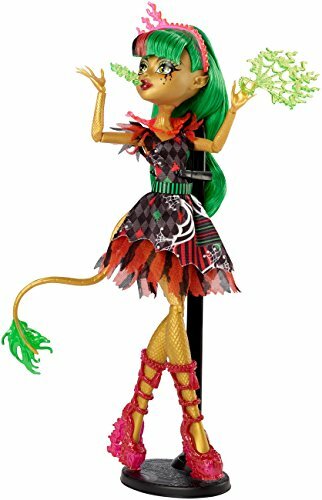 Includes Jinafire Long doll wearing fashion and accessories, flame-inspired fan, “blowing flame” piece, doll stand and mini Freak du Chic poster. Doll cannot stand alone. Colors and decorations may vary. 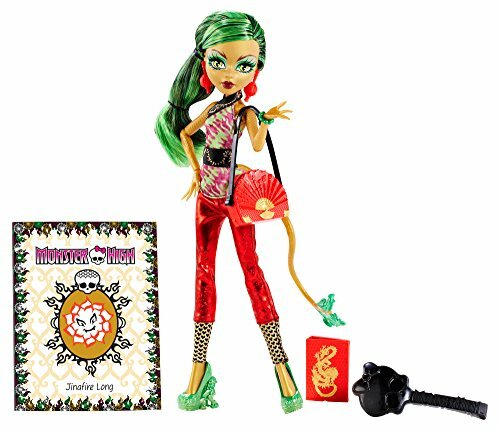 Get away with some of your favorite Monster High character dolls dressed for frightseeing and fierce island fun! These beast friends are ready for a wild vacation in outfits inspired by jungle elements. The fashions are fierce and the accessories to-die-for! Articulation at the shoulders, elbows and knees adds to the fun with more scary cool poses and storytelling possibilities. 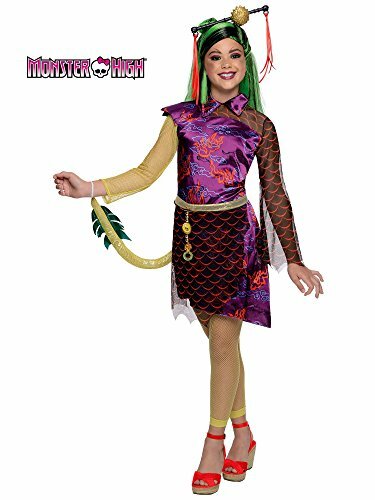 Choose from fiery Jinafire Long doll, daughter of a Chinese Dragon, in a tiki mask-inspired print with flame-detailed shoes, chest plate, jewelry and hairpiece; clawesome Meowlody doll, daughter of a werecat, wearing a dress with an iconic jungle print, warrior-inspired collar and jewelry, fishbone-detailed shoes and a headpiece; and boo-tiful Spectra Vondergeist doll, daughter of the Ghosts, in a floral print with jewelry, shoes and headpiece that mix chain pieces with leafy accents. Monsterrific details, like signature hair coloring, showcase their freaky fabulous flaws. 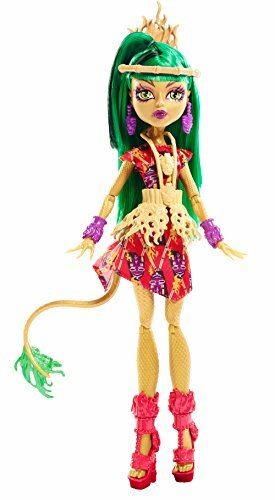 Ghouls at home will love learning to embrace what makes them unique along with their beast friends from Monster High. Collect them all for the vacation of an un-lifetime! 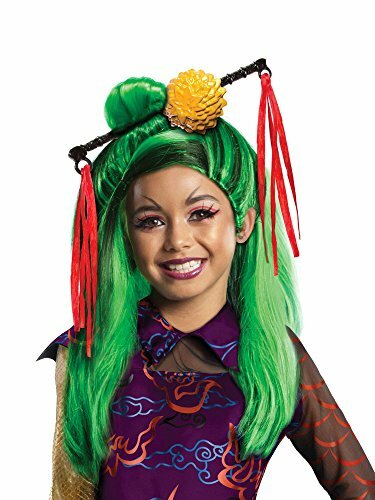 Includes fashion doll wearing clothing and accessories. Each sold separately, subject to availability. Dolls cannot stand alone. Colors and decorations may vary. Size: 6 x 2.5 x 12.8"
What can I say Jinafire is clawsome she is my fourth favorite character my first is Draculaura second is Lagoona Blue and third is Catty Noir. Btw in case anyone did not know Chinese New Year is on Feb. 8.